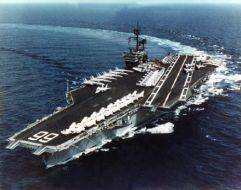 USS AMERICA was the third KITTY HAWK - class aircraft carrier and the third ship in the Navy to bear the name. 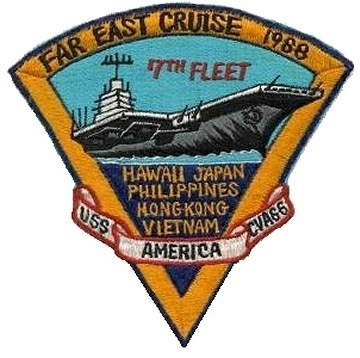 Initially commissioned as attack aircraft carrier CVA 66, she was redesignated as multi-purpose aircraft carrier CV 66 on June 30, 1975. Decommissioned on August 9, 1996, the USS AMERICA spend the following years at the Naval Inactive Ships Facility in Philadelphia. 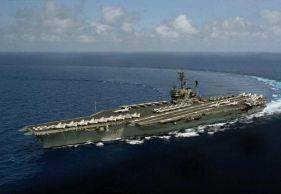 On April 19, 2005, the carrier left Philadelphia under tow on its final mission. 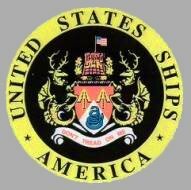 The AMERICA was towed off the east coast where the ship was finally disposed of during a classified SinkEx. 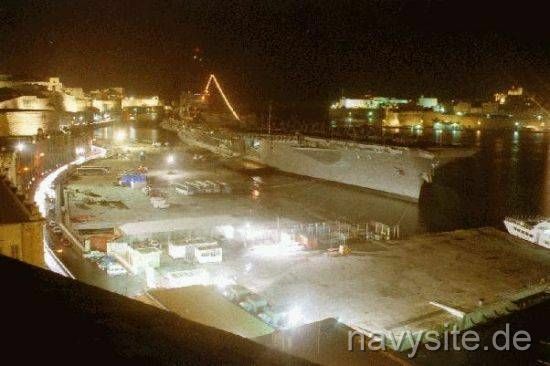 USS AMERICA never really went through the Navy's Carrier Service Life Extension Program (SLEP) and therefore, the ship was in bad shape during its last years of service. 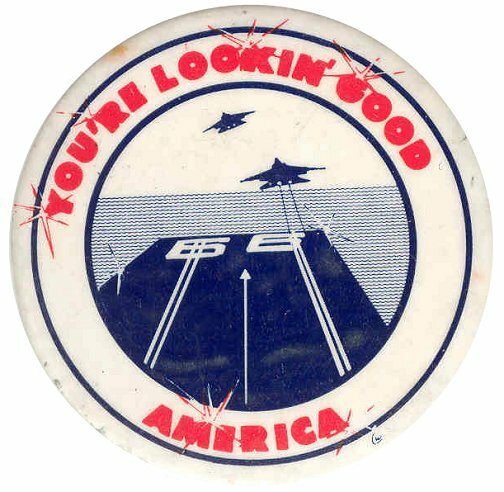 In the early 1990s the AMERICA even had one of her flight deck elevators fall with an S-3B aircraft and several blueshirts on it. 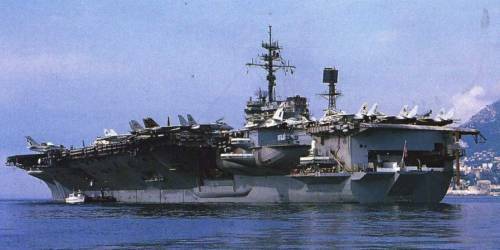 Additionally, the carrier suffered steam and fuel leaks and - also in the early 1990s, returning home from deployment - the carrier cut through a Hurricane destroying large parts of the flight deck catwalks. 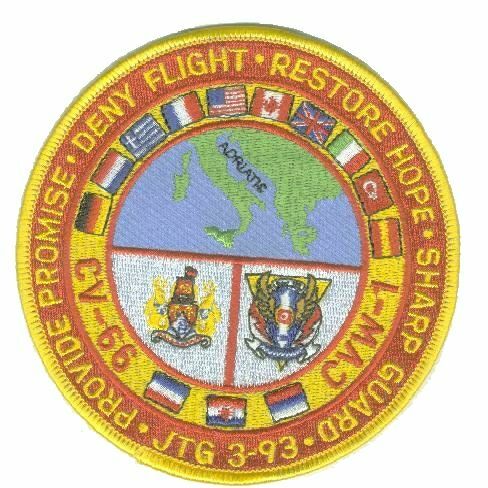 June 15, 1979 Adriatic Sea LT Talcott is lost at sea in an A-7E while AMERICA is participtaing in the US-Italian exercise Tridente. 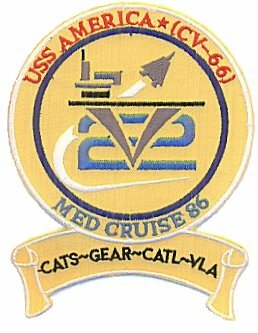 December 3, 1980 250 miles east of Charleston, SC USS AMERICA and USS CALOOSAHATCHEE (AO 98) collide during an underway replenishment when the oiler loses rudder control. Despite an emergency breakaway, AMERICA suffers minor damage to a catwalk, a storage compartment and a flight deck safety net rail. But there are no injuries and both ships continue operations. June 15, 1984 Indian Ocean While operating in the Indian Ocean, an F-14 aircraft from VF-33 crashes on the flight deck in a Class Alpha accident causing more than $500,000 in damage but no injuries. 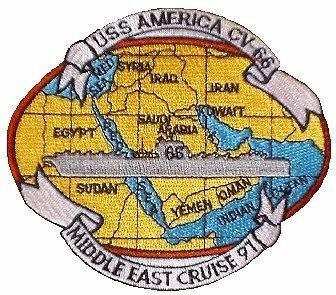 May 13, 1989 mid-Atlantic A fire in the pump room of USS AMERICA kills two sailors and causes minor damage while the ship is in the Atlantic en route to the Mediterranean for a six-month deployment. August 1990 A steam line burts aboard the USS AMERICA. 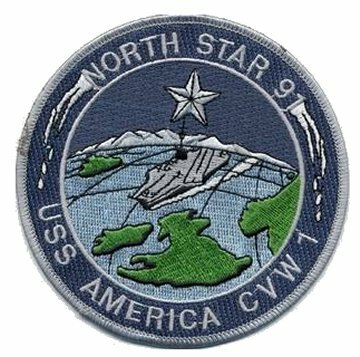 March 11, 1994 USS AMERICA suffers an explosion. August 18, 1998 Philadelphia, Penn. USS SEATTLE (AOE 3) hit the decommissioned USS AMERICA while leaving a slip in Philadelphia, sustaining minor damage. A civilian harbor pilot, not the SEATTLE's regular pilot, was at the helm during the crash. 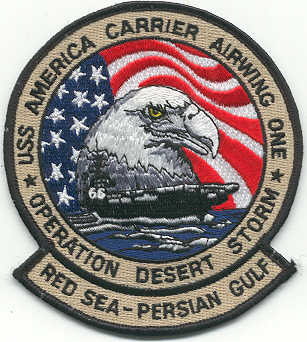 Click here for more USS AMERICA Patches.